Welcome, and thank you so much for taking the first step and recording your decision to donate on the NHS Organ Donor Register. You have joined the millions of people bringing hope to those in need of a life-changing transplant. It is essential to let your family know that you have made the decision to donate your organs and/or tissue when you die. 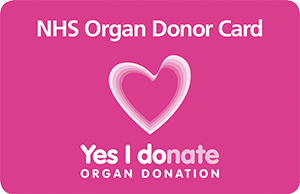 When registering as a donor, you told us that you would like NHS staff to speak with your family (and anyone else appropriate) about how organ donation can go ahead in line with your faith and beliefs. Please discuss with your family your decision to donate and what you want to happen when the time comes. Your family will be able to act on your behalf and let the NHS staff know what your requirements are. We send a standard organ donor card to everybody who registers for the first time. We also have a number of digital donor cards based on the main faith and belief systems in the UK that you can download now.